I remember last year, having a conversation with someone who said to me “you’ll end up fighting Farida one day” to which I responded with laughter. At the time, the thought of me fighting someone as skilled as Farida was something I was yet to consider. 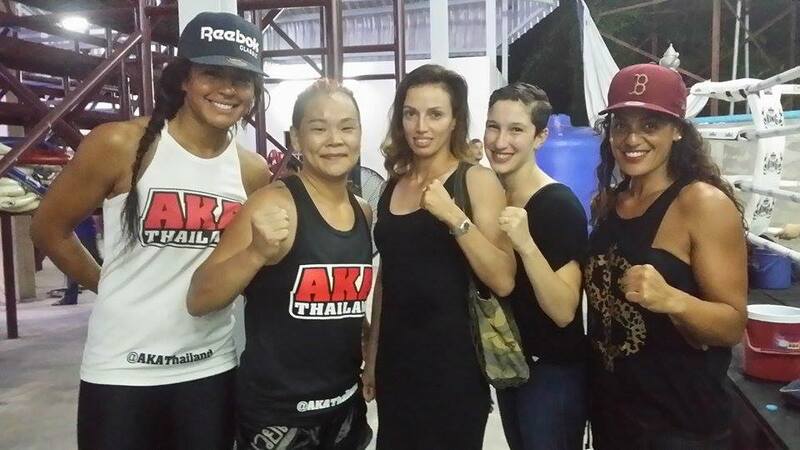 A few weeks ago, when the promoter from Chalong Stadium asked if I wanted to fight Farida I jumped at the opportunity. I wasn’t sure how the fight would go, but I considered it a great opportunity, and a fight where I could really measure where I was at. 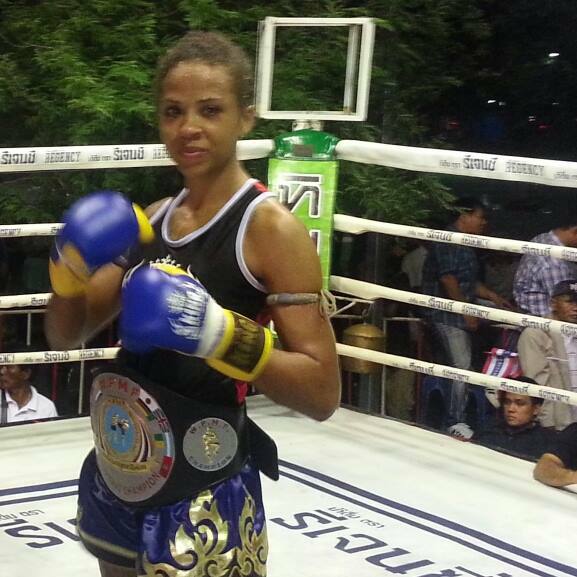 For those of you who don’t know who she is – Farida is a current WPMF and WWBA World Champion and is well known in Phuket to be one of the best on the island. She is also well known for taking on much bigger opponents and beating them. I just want to be really clear about something. I don’t consider myself to be a world class athlete. I am not there yet. I am not suggesting that I won’t get there one day, with time and hard work, but I can recognise where I am at on this scale. So the opportunity to fight a current World Champion – who can say no to that?? This fight as a yard stick, so when I heard that a tonne of Thai trainers from other camps had said that I would get cut open and TKO’d, I was not surprised. Camp was relatively short for this fight as I had just come off the loss from my last fight and straight back into training – stitches and all. Unfortunately the cut from my previous fight meant that I was unable to spar or clinch until my final two days of training. Luckily, this was not the first time I have prepared for a fight in this fashion, and reminded myself that my skills were not lost or forgotten. It was also a great opportunity for me to drill some new positions in the clinch and to work on the technical aspects of my game. excitement as the new program rolled in. What did this mean for me? Adding 4 Cross Fit sessions into my last week of training. Not the smartest idea in the world as I was so exhausted and run down by the end of the week that I was beginning to question if I would get in enough rest for my fight. What can I say. I don’t do anything in halves, and I am ADDICTED to training. A part of me knew though, that with an opponent like Farida, I did not want to leave anything to chance. No stone was unturned. I was determined to do as much as I humanly could before this fight because it was so important for me to do well. My cut had healed remarkably well, although we were conscious of the fact that one good elbow to the area, was likely to bust the wound open. A lot of long guard practice went into this fight prep although I was lucky to not really need it. Over the last year, Farida and I had become friends, so it was a bizarre sensation to fight someone I knew and really liked. I wondered if it would be weird, or if it would make me hesitant. At the end of the day, my determination to win took over. As we began getting ready at the stadium, I noticed the presence of an unfamiliar feeling. My first thought was that it was anxiety which made absolutely no sense to me. So what was it then? It was nerves! Pre fight nerves is something I don’t often experience, or rather ever experience, so it was an interesting sensation that I was having to really focus on to control. It was like my first amateur fight in Australia. I was so excited and nervous that I almost wore myself out before I got in the ring! The first two rounds for me were important, not only to establish where I was at in the fight, but to also establish how Farida felt. I was quite aware that if she felt like she could steamroller me, she probably would; I wanted to be prepared. 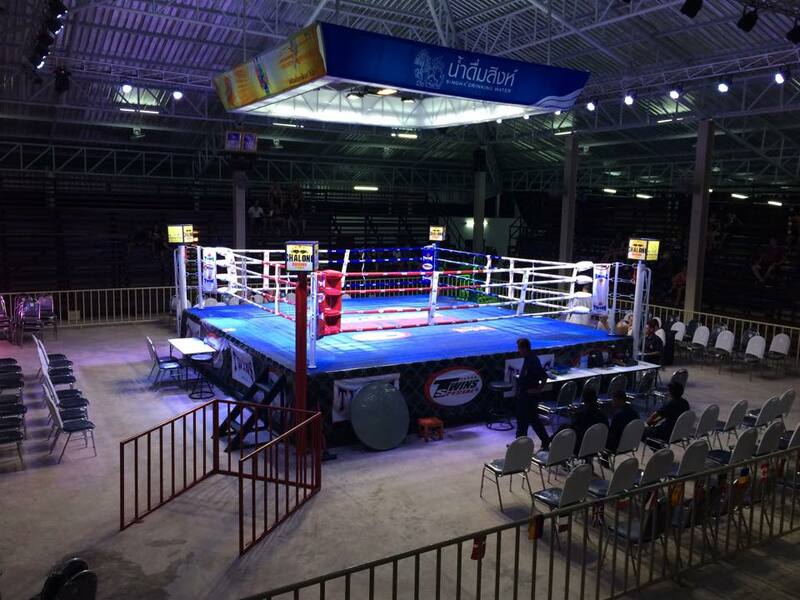 Round 1 begins in typical Thai fashion. As her first kick comes out, I feel the weight and power of the kick and remember thinking to myself, this is going to be a long 5 rounds for my shins! Funny the things that pop into your mind. As the round continues, I start leaning back out of the way of her kicks. Something I have drilled a lot, but never really managed to utilise in my fights. She kicks right, waits, kicks left, both kicks avoided. This is good. I feel sharp and on point. Time to start countering. We have some nice exchanges and I feel like I am moving forward for the most part. A solid first round. Round 2 starts, and she is using more boxing combinations then I had expected. She’s not lost any fire on her kicks and she has started throwing some nice step up knees. I am actually happy with how well I am checking and avoiding kicks although my left shin is starting to take a beating. I am not countering as well as I would like but we walk away with a fairly even round. My corner is happy when I return. Now for the fun part! Time to see how I match with her in the clinch. As we move into round 3, I am trying to remember to utilise my jab more. I have to remember that it doesn’t always need to land, just use it more to get in. I am not doubt taking a little damage getting into the clinch, wearing a few solid kicks, and narrowly avoiding a few elbows, but once I am in the clinch I feel like we are reasonably matched. The clinch has always been my strong suit, but this fight was tough to gauge. What was really interesting to note, was that this was the first time I felt really clear minded in the clinch. Getting good control position was tough in 10oz gloves, but I was actually processing and working, instead of it feeling like a blur. As I head back to my corner, there is a buzz; “Gemma – you are winning! Let’s keep working. You can do this!” I knew it was a good round, you can feel it when you’re in there. I tried to not worry about the winning comment, just to listen to the instructions and try to implement. As per usual, I was told I was being too slow. Speed is not often on my side and it’s something I need to really work on. At the beginning of round 4, Farida gets me into the corner and in a compromising position. My head is down and I am not balanced enough to throw proper knees. She is outscoring me in a big way and I was conscious that I needed to pick up my game if I wanted to stay in this. We have another good exchange where I begin to close the gap followed by a good stiff jab throwing her off balance a little. We continue on and at the end of the 4th round, I get her into a strong position where I feel like the points gap has closed again. When I return to my corner they tell me, “ok, that round was her’s, you weren’t quick enough at the start, but that’s ok, you can make it up now”. As we start the final round, it’s all or nothing. We both know it’s close and we both want the win. She throws a big up elbow that lands right near my cut and I am just waiting for blood to start dripping. Nothing. I am still checking kicks well although Farida has started using her teeps against me and I am not being effective enough against them. It’s also preventing me from getting back into the clinch. My corner tells me to stop fighting about 1o seconds out and I’m not really sure if they think I have won or not. After all 5 rounds were over, it was the land of smiles in that ring. Farida kneels on the ground and gives me a big kiss on the cheek and a hug. We have had an awesome fight and we are both happy. This fight was for the Chalong Stadium Title, and what I didn’t realise is that a) they would score all 5 rounds and b) we would be given the final score at the end. Knowing that they were scoring all 5 rounds might have changed my game a little, but I don’t think by much. 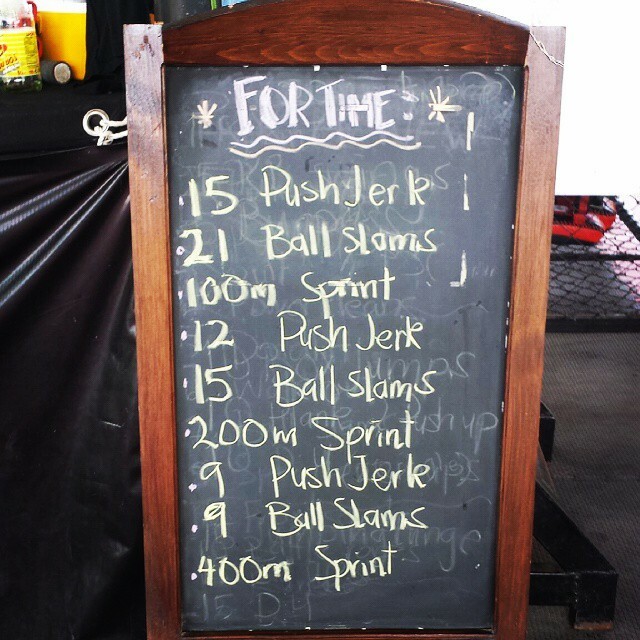 I would have still taken the first two rounds with caution, although it’s nice to be back in the mentality that every round counts. As the decision was handed down, the scorecards read – 49 – 48 – red corner (Farida). The most important thing about getting the scores for me, was realising how close it was. It didn’t take away the sting of my 3rd consecutive loss though. As we moved out the back to take off my gloves I burst into tears, completely embarrassed and heart broken over another loss. No one could understand why I was crying though. My trainers and team, friends and supporters, had told me it was the best fight I have had to date. They weren’t wrong, and a part of me knew that, but it didn’t take away from the fact that I had not being doing well for AKA, and I really really wanted to. Being somewhere, where I feel respected, where my hard work and dedication is appreciated, it makes me strive for more. Not only for myself, but for the people who are investing in my career. I am fully sponsored by AKA and I would love nothing more than to have a successful second half of the year for them. When all is said and done, this IS my best fight to date. I AM still improving and getting better. I went 5 rounds with a current World Champion and I did not feel out of place or outclassed. These are the things I am focussing on. I still have so much to work on, and add into my game, but I feel like the next 6 months are going to be big! Hi Sam. I realize this is a ridiculously late reply but I just wanted to say thank you for this. It really motivated me in a time where I desperately needed it. I am glad you enjoyed the fight!